Jay-Z Started his Own Sports Agency | Why and How? Founded in the Spring of 2013, Roc Nation Sports is a fledgling American sports management firm owned by Shawn Carter (aka Jay-Z). It is a branch of Roc Nation, Jay-Z’s full-service entertainment company. Immediately after announcing the formation of his new venture, Jay-Z also announced the signing of his first player – New York Yankees All-Star second baseman Robinson Cano. At the time, the signing of Cano was considered a major coup for the upstart agency, and shortly thereafter, the sports agency announced a joint partnership with an industry stalwart, the Creative Artists Agency (CAA). Since then, the day to day operations and behind the scenes machinations of Roc Nation Sports has remained something of a mystery. From claims of tortious interference to the violation of Players’ Association regulations, Roc Nation Sports has certainly had its fair share of critics and naysayers, but the dogged agency continues forward and continues to thrive. 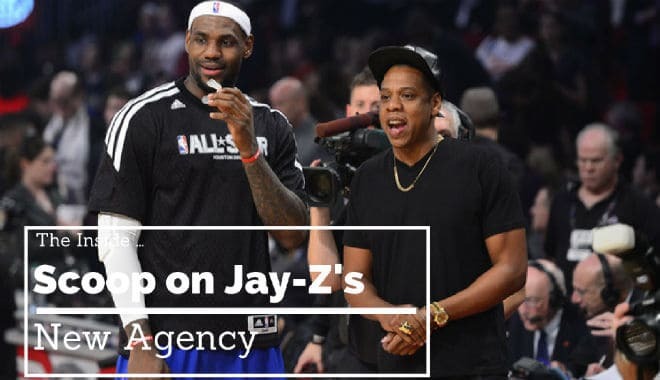 Although one might expect Roc Nation Sports to have become a mega agency by now, the agency’s employees insist that it operates best as a high-end boutique agency. The firm touts its family-oriented approach, high-end marketing services, and personalized attention as the primary reasons why it continues to sign new athletes, but there is no denying that the agency’s owner, himself, is a big draw. In a recent interview with The Washington Post, company officials stated that it is Jay-Z’s deep pockets that allow the agency to put their clients’ interests ahead of the agency’s own interests. Currently, Roc Nation Sports has a roster consisting of around 25 players across multiple sports, including baseball, American football, basketball, tennis, boxing, and association football. No concrete figures regarding the total value of these contracts are currently available Jay-Z himself has officially earned licensure as a sports agent for the National Basketball Association and Major League Baseball; however, it is unclear how much face time he is able to invest in his players. Critics point to the blundering of a deal negotiated between Roc Nation Sports and the Seattle Mariners, on behalf of Robinson Cano, as evidence of the agency’s inability to act in its players’ best interests. In 2013, Cano’s agents, led by Jay-Z, were seeking a 10 year, $310 million, which would have been the largest baseball’s history, in order for Cano to remain with the Yankees. What resulted from the fray was a 10 year, $240 million deal with the Seattle Mariners. Detractors believe that, with the Mariners lacking supporting talent to make them competitive in the near future, Cano lost out on the opportunity to make millions in endorsements and a potential chance to make it to the MLB Hall of Fame in the future. In January of 2015, Roc Nation Sports was publicly snubbed by three boxing champions it had been courting, including Adrien Broner. One fighter, who spoke on the condition of anonymity, said that he took personal offense to the fact that Jay-Z did not personally reach out to him during the recruitment drive, but instead, sent his people to do the negotiating and bargaining for him. By February of 2015, the Creative Artists Agency announced that they and Roc Nation Sports were mutually ending their partnership. Throughout the duration of their partnership, Roc Nation Sports took the reins when it came to sponsorship deals and marketing, while the more experienced CAA handled the negotiation of players’ contracts. It is unclear exactly what led to the split, but it was rumored that Roc Nation Sports had become too competitive for CAA’s tastes. Unnamed sources stated that CAA had begun to view Roc Nation Sports as a liability. The young sports agency’s history of ups and downs highlights the struggle of new agencies to make it in a cutthroat business that has recently seen an influx of new entrants into the game. Outsiders have never quite been able to figure out Roc Nation Sports’ game plan, and this is both a part of its allure and its frustration. In the last two years, Roc Nation Sports has concentrated on building its roster of sports agents and internal staff, but what has confounded watchers is their decision to focus on recruiting unknown agents. Kim Miale is now the head of Roc Nation’s football division; however, four years ago, she was a relatively unknown NFL agent who had represented a few players on the fringe rosters of NFL teams, but currently had no one actively playing in the league. The agency now employs six full-time staffers whose sole responsibilities are to act as the point people for the athletes on Roc Nation Sports’ roster. From scheduling business meetings to scoring exclusive restaurant reservations at the last minute, it is a type of concierge service that is more commonly found in the entertainment industry. Industry insiders expect, in the near future, for the focus of Roc Nation Sports to turn from player contracts to endorsement deals. When it comes to player contracts, sports agents earn a specific amount. For example, in the NFL, an agent earns 3% of the total value of their player’s contract. However, when it comes to endorsement deals, an agent can earn as high as 15% of the value of the deal. Indeed, Roc Nation is an internationally recognized brand that transcends sports alone, and it is this marketing power that Roc Nation Sports can harness to truly distinguish itself from other sports agencies. Currently, Roc Nation Sports has an eye towards the future – recently signing Henry Elleson, Michael Gbinije, and a slew of other NBA wannabes ahead of the upcoming draft. Outsiders can only speculate what the future will hold for Roc Nation Sports. What is certain is that Roc Nation Sports is changing how things are done.